IDF moves two anti-missile installations to north following alleged Syria airstrikes. 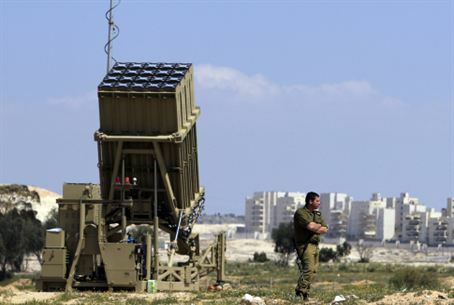 The IDF has moved two Iron Dome anti-missile installations to northern Israel. The move follows media reports according to which Israel took out two weapons shipments in Syria. The installations were moved overnight Saturday, and have been set up in Haifa and Tzfat. The Iron Dome can shoot down medium and long-range missiles and rockets. It has been used with a great degree of success to protect cities in southern and central Israel from Hamas rocket attacks. The move comes as Israel faces growing tension with its northern neighbors, Syria and Lebanon, over alleged airstrikes. IAF planes reportedly flew over Lebanese airspace to hit targets in Syria. An Israeli source confirmed Saturday that Israel had bombed “game-changing” weapons meant for Hizbullah on Friday. According to the New York Times, the IAF took out Fateh-110 missiles sent by Iran. If Hizbullah had Fateh-110s, it would be capable of hitting Tel Aviv. A second series of explosions was reported overnight in Damascus. The official Syrian news agency SANA claimed that Israel carried out an airstrike on the Jamraya research center. The Syrian opposition reported that the explosions hit strategic military sites.